Today was the final face to face meeting for our Dublin-Dallas cohort during our year-long immersion in PLP thinking. I was fortunate to be on a team of five other very smart educators from my school, and it was a delight to spend this entire year learning alongside these ladies. We all grew a lot and more importantly, over this time, we have developed an action research plan for our building that addresses collaboration in our building - we looked at the structures already in place, and thought about how we could "grow" these structures in breadth and depth. We're all looking forward to putting the plan into action starting this summer. Our Dublin-Dallas cohort has met multiple times throughout the year in Elluminate sessions online; each 2 hour session focused on certain topics to help push our thinking when it comes to connected learning. As nice as those sessions were, today's face to face session was incredibly powerful. It is a little ironic how much I valued this face to face time, when all year long I've been trying to stretch my connected learning. I've really learned to push my own personal boundaries of learning as well as my students - this was the year we shared a blog with a class in Maine to talk about a book we were both reading aloud. Then, in celebration of all our thinking, we had a Skype book chat on the final day of the book. My goal has really been to break down the 4 walls of our classroom when we think about how we learn. This was a year that students started bringing electronics (iTouches and iPads) to school to enrich what was already going on in our classroom. I watched amazed recently during writing workshop at how students had multiple tabs opened on their laptops while working on their final project, and right beside the laptop lay their iTouch or iPad, ready with notes they had taken or videos they wanted to import. Another student had a flip video where he recorded himself at home explaining the touch screen of an iTouch. There is no longer a dividing line between what happens at school and what happens at home. The walls of our classroom truly are coming down. But back to today - today consisted of all groups sharing their action research projects, then breaking apart to discuss topics of interest to us (iPads and project based learning were just two of the choices), we moved on to more breakout group conversations to discuss the roadblocks to implementing 21st century thinking (great discussions! ), we talked about our digital footprints, and finally we came together to form action plans for the issues we identified as top priorities. So much big thinking, and not enough space here to share it all. However, if you want to "poke the box" of your own learning (a phrase one of our co-leaders, Will Richardson used frequently), I am including my notes from today that I put on google doc. If you really want to stretch yourself, go the the PLP website and look at their offerings for the coming year. A huge thanks to my GRE team, the other PLP cohorts, Will Richardson, and Sheryl Nussbaum Beach for making this year such an important one in my own learning. Don't you love it when you find a book at exactly the perfect moment?! 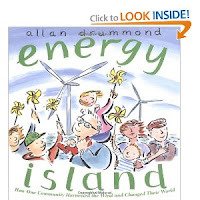 That's what happened with this great nonfiction picture book Energy Island: How One Community Harnessed the Wind and Changed Their World by Allan Drummond. I found this book last Saturday. This Tuesday begins some learning about renewable and nonrenewable energy sources in our classroom. How timely was that? I was absolutely meant to buy this book! Energy Island is a story based on a real island, Samso, located in the middle of Denmark. Drummond actually read about this island in The New Yorker magazine, and knew right away that the topic had potential as a picture book for children. How right he was! He went to Samso and interviewed the people there, specifically Soren Hermansen, who was chosen by the Danish Ministry of Environment and Energy to lead a project that would allow Denmark to become independent of nonrenewable energy. 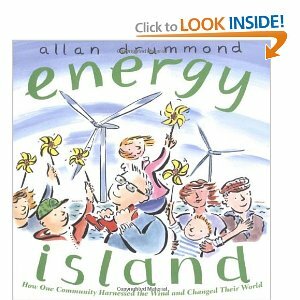 Drummond's text clearly tells a story about people on an island who are very typical of many others - in how they live, play, and use energy. One of the reasons I enjoyed this story so much is that Drummond keeps coming back to the point of how slowly change came to the people of Samso. More than that, the powerful message is that the young children were some of the first to embrace the need for change; most adults came to the idea of changing energy habits much later. In the end, though, Energy Island is a story of huge success -- the islanders of Samso harnessed energy from the sun, the wind, straw, and fuel oil from canola crops. Some people embraced big ideas for how to use more renewable sources of energy; others started smaller. But everyone became part of the solution. In addition to this great storyline of gaining command of renewable energy sources, Drummond has wonderful illustrations that are very kid-friendly and easy to understand. But, the final piece that I love about this nonfiction picture book is the sidebar information he inserts from time to time to better aid the understanding of what these big concepts are. All this packed into one picture book makes Energy Island a true winner in my book! I can't wait to share it with my class this Tuesday so that hopefully they can start to make a difference in the world in which they live much like the children of Samso. For more great nonfiction titles and ideas, check out Writing Nonfiction for Children for the entire Nonfiction Monday roundup. Lemonade is Fun to Make! 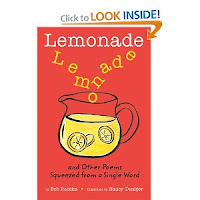 Last Saturday, I picked up a new poetry book titled Lemonade and Other Poems Squeezed from a Single Word by Bob Raczka. The front cover was bright and colorful, but the true fun began when I opened the book. I was fascinated by the concept - poems made using only the letters in the title word. It is even more fun that the focus is to initially keep the letters spaced in the way the title words' letters appear. Raczka has taken this concept and written 22 poems of his own where he "squeezes" the poem from a single word. With each poem, he initially writes it in the same format as Andrew Russ did. Then, on the next page, he rewrites the poem using stanzas and with letters beside one another to make words. So much word play fun!! I cannot wait to try this with my own students next week for Poetry Friday!! For more about Lemonade, check out 100 Scope Notes - Travis calls it a "Best New Book" - high praise indeed! And totally justified!! And for more Poetry Friday Fun, visit Book Aunt for the entire poetry roundup. If you live anywhere in the Central Ohio area and haven't attended one of the Literacy Connection's fall workshops or year-long author studies culminating in the author visiting in the spring, you are really missing something very special. I would strongly en courage you to try to attend if you can. This year, the year-long study focused on Debbie Miller and her thinking in the book Teaching With Intention. For several months teachers have read this book, responded to it, and some have even done projects that involved some type of action research in their own classroom using the main premises of "Teaching With Intention." Then, this weekend, Debbie visited Columbus, specifically Wickliffe Elementary in Upper Arlington. On Friday, she worked with a class of primary students in the morning and a class of intermediate students in the afternoon while visiting educators were viewing it in real time in another location in the school. Then, on Saturday, everyone reconvened at Wickliffe as Debbie shared some basic beliefs and processed what had happened the day before. 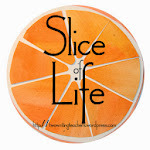 What's nice about these Literacy Connection offerings is that you have choice in how much you participate. This year, I was only able to attend the Saturday workshop, but even that one day still has my brain spinning 24 hours later. First of all, D ebbie Miller is such a kind, gentle person, and I could listen to her speak for hours. She has such a lovely voice. And she's so smart as well!! I chuckle as I read that last sentence, because just like Samantha Bennett said last year when she came for Literacy Connection, Debbie states that we shouldn't identify kids as "so smart", but rather NAME the behavior or thinking or product that shows why you might think that. So, in the interest of time, insead of waxing eloquently here about all the "smart" things Debbie believes and shared with us, I am linking to my GoogleDocs notes from yesterday. Hopefully, they will make sense. 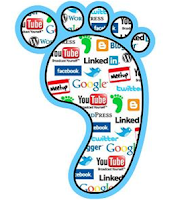 If you have a twitter account, several of us were tweeting throughout the session yesterday - look for #litconn11 . I will say that after hearing Debbie speak, it continues to reinforce my beliefs in time for kids, making thinking visible, giving students choice, and teaching intentionally. In addition to Debbie sharing her thinking with us, I also love these Literacy Connection Saturdays because Cover to Cover / Selections Book Fairs comes with the best and the brightest books for children. I actually controlled myself and only purchased 7 books (see my picture pile), but that's only because I wasn't shopping at the same time as some of my friends - it could have been much worse!! And speaking of friends, yesterday was also a wonderful time for me to touch base with friends and colleagues from a variety of school districts, and meet new people as well. As I've thought a great deal about 21st century learning this past year, I realize how important the PLNs that I actively seek out are to me. I need the collaborative thinking of all these people. Yet another reason to love my Literacy Connection Saturday! Literacy Connection is an organization worth both participating in and supporting. Thanks so much to this group for bringing the lovely Debbie Miller to our area, and a huge thanks to Debbie for so kindly sharing her thinking with us. For more thinking about this day with Debbie, check out Mandy's post at Enjoy and Embrace Learning. I started a new read aloud this week: Because of Mr. Terupt by Rob Buyea. The days we start our new read alouds are some of my favorite days all school year long. These are the days we preview, and get our thinking together about the possibilities based on cover and flap information. I give each student a paper with the front cover, back cover, and inside flap information on it. Then, we take 20 - 30 minutes to process our thinking about what exists in front of us. I have included a picture of the SmartBoard where I captured their thinking. I love the feeling that we're all on the same page before I start reading, even when I know that some o f their predictions are incorrect. The thinking you see here is what we will come back to time and time again as we read this story together (there is more thinking on other SmartBoard pages about inside flap and back flap, as well). It is such a powerful way to show the students how they have to revise their own thinking as they read. How things seem in the beginning can be far different than how they are at the end (never better evidenced than in our last two read alouds, Out of My Mind and When You Reach Me). I know some of my students read my blog sometimes, so I don't want to give away too much about this story. However, I will say that some of their thinking after only seeing the front cover, which is mostly visual in nature, was pretty darn insightful. I was quite a proud teacher for the types of thinking they were sharing. 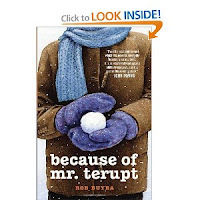 So, we've begun the story of Mr. Terupt and his class, and I know setting the stage will only heighten the enjoyment and understanding we will all take from this story. And on a related note, Mr. Terupt most definitely belongs in 100 + Amazing Teachers that MaryLee and Franki started at A Year of Reading. I've been a fan of Gary D. Schmidt's books since I read Lizzie Bright and the Buckminster Boy. I was such a fan of that book that Joyce and I chose it for our very first Grand Discussion. 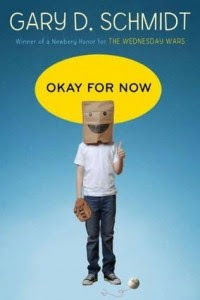 Wednesday Wars always makes my list of favorite books and now one of the characters from that book, Doug Swieteck, takes center stage in Schmidt's newest book, Okay for Now. On a recent trip to Cover to Cover, Sally asked if I'd like an ARC of the book and of course I said yes. According to the info on the book it will be released on April 18, don't wait, order it now, you won't be disappointed. Doug Swieteck has a tough life. He is the youngest son of a father who is unhappy, beyond unhappy, he's miserable. Doug's father hates his job and constantly gripes about his boss and how much better he could do the job. When he comes home he takes his frustrations out on his family. Although the author doesn't specifically describe the abuse, it's clear that the three Swieteck boys and their mother have endured plenty and can only look forward to plenty more abuse from the "quick hands" of Mr. Swieteck. Because he is the youngest, Doug also takes abuse from his older brothers. We learn in the beginning of the book that his oldest brother, Lucas, is in Vietnam, but the third brother Christopher is home and willing to dish out the verbal abuse when their father isn't around. All in all, Doug has a tough life. The only thing he ever had to take pride in, the hat given to him by Yankee player Joe Pepitone, is taken by his brother and lost. Fortunately for Doug, he is strong and resilient. When the family moves so that Mr. Swieteck and take a job along side his friend Ernie things don't look good. They move into a house in worse condition than the one they leave and the father's friend is, to say the least, not a good influence. Everything about the move spells trouble for Doug. As the story goes on it becomes clear that the move is really the best thing to ever happen to Doug. When the family arrives in Marysville Doug stumbles on the public library where one librarian marks him as a thug right away, but another, Mr. Powell, spots him studying the original paintings of John Audubon and discovers Doug's hidden talents. Mr. Powell fosters these talents over the course of the book and the paintings give Doug a personal mission. Doug also meets a girl, Lil Spicer, who sees redeeming qualities in him and helps get him a delivery job at her father's deli. Their friendship is charming and simple and helps give the reader hope that Doug will break the circle of abuse he is trapped in. When he starts school, he's marked as a trouble maker before the first day by the principal, Mr. Peattie who has the strange habit of referring to himself as Principal Peattie in every conversation. All of his teachers also peg him as trouble because of his brother Christopher's troubles and won't even give the guy a chance. All but Mr. Ferris, who on the first day of class explains to Doug the scientific principle that "two bodies cannot occupy the same space at the same time." In other words Doug is not Christopher...SUPER TEACHER! The book is amazing, I started reading in the morning and could not put it down until I had finished all 368 pages. Gary D. Schmidt is a wonder story teller, creating characters that the reader will love, some are completely unlikely, and some, like PE teacher Coach Reed who is totally unlikable until we learn his whole story and then, like Doug, forgive him his meanness. Even with all of it's sadness and heavy story lines, Okay for Now is really a story of hope. The ending will leave you hanging and wondering, but for me, I believe Doug is going to be okay for a long time. More Bears are Making More Noise in THE PIT! Things got a little noisy in THE PIT today. I started reading a book I found called More Bears by Kenn Nesbitt and there really is only one way to read it...LOUD! The story starts out quiet enough with an author writing a nice lovely story that has absolutely no bears. But then, sort of like me when I come across a book I really like, the author begins to hear voices. The voices are asking for, "More bears!" As the story goes along and the demands for more bears become more enthusiastic, the author begins to add more bears, starting slowly at first with a cuddly-wuddly baby bear, a mama bear named Stella and a papa bear named Captain Picklehead. The voices demand even MORE BEARS and the author begins adding bears at a frenzied pace. Bears riding pink bicycles, playing ukuleles, surfing, wearing lederhosen and the list goes on and on and on until there isn't room for anymore bears on the page. All of them expertly illustrated by Troy Cummings with lots of things to look for and at on every page. When reading this book aloud, it's hard for me to keep myself from working into a wild frenzy and it just keeps getting louder and louder and the kids all join in yelling for MORE BEARS and IT IS AWESOME!!! The surprise ending leads to lots of laughter and giggles in THE PIT and I am reminded why I love my job!